'Picking Plum Blossoms' is based on a recent triptych of ceramic vessels decorated with Japanese figures. 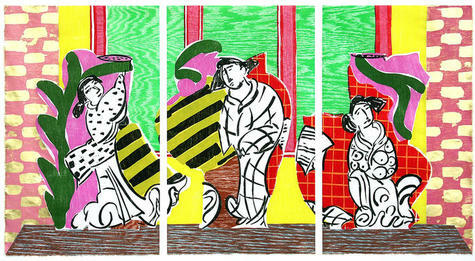 In the woodcut she has carefully chosen the distinctive grain of various woodblocks, with gold leaf and chine collé, to create rich textures and patterns. These elements, with the characteristic carved woodcut line and her lively colors, coalesce in a spring-like three-panel print.